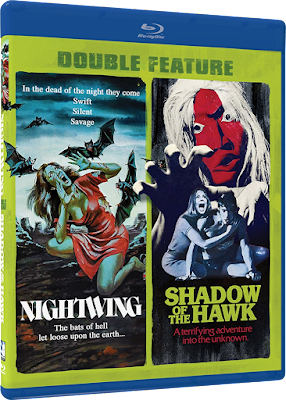 THE B-MOVIE NEWS VAULT: Mill Creek Entetainment's Double Feature of NIGHTWING and SHADOW OF THE HAWK Comes to Blu-ray on October 16th! 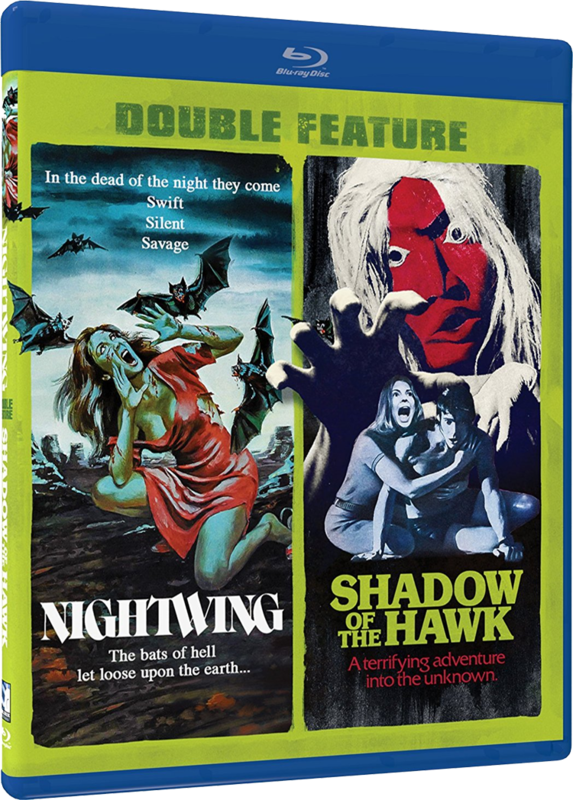 Mill Creek Entetainment's Double Feature of NIGHTWING and SHADOW OF THE HAWK Comes to Blu-ray on October 16th! 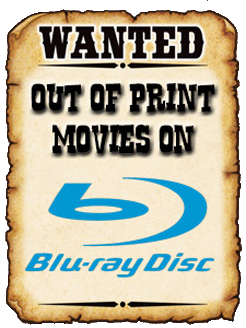 GET A DOUBLE DOSE OF NATIVE AMERICAN FOLKLORE WITH MILL CREEK'S LATEST BARGAIN-PRICED BLU-RAY RELEASE! UPDATE (10/02/2018): The street date for Mill Creek's NIGHTWING / SHADOW OF THE HAWK Blu-ray has been pushed back yet again! Now it is due out on October 23rd. I am so overcome with joy Vault Dwellers! When I saw this double feature Blu-ray pop up for pre-order on Amazon, there was absolutely NO hesitation when I added it to my cart. Both NIGHTWING and SHADOW OF THE HAWK were both staples of my youth, and I have fond memories of watching them late at night on TNT. I haven't seen any reviews about the film transfers yet, but they have to be better than the VHS-rips I've been watching for the past decade! Regardless, next week I'll be excitedly popping this disc into my Blu-ray player, and taking a trip down memory lane! NIGHTWING Synopsis: A wave of mysterious deaths on a Native American reservation in New Mexico are being investigated and…it's killer bats! Directed by Arthur Hiller, and starring Nick Mancuso (DEATH SHIP, UNDER SIEGE), David Warner (WAXWORK, TIME AFTER TIME), Kathryn Harrold (RAW DEAL), Stephen Macht (GRAVEYARD SHIFT, THE MONSTER SQUAD), and Strother Martin (COOL HAND LUKE, THE WILD BUNCH). SHADOW OF THE HAWK Synopsis: The aging Indian medicine man Old Man Hawk arrives in the city to request help of his grandson Mike, a successful business executive. Old Man Hawk is fighting a sorcerous war with the witch Dsonqua who was executed two hundred years before and is now seeking revenge. Mike, who has no interest in the Indian ways, is reluctantly drawn in to helping. Joined by a woman journalist named Maureen, Mike agrees to drive his grandfather three hundred miles home. But along the way Dsonqua increases her efforts and summons magical forces to destroy them. Directed by George McCowan and Daryl Duke, and starring Jan-Michael Vincent (THE MECHANIC, WHITE LINE FEVER), Chief Dan George (LITTLE BIG MAN, OUTLAW JOSEY WALES), Anna Hagan, and Marilyn Hassett (TWO-MINUTE WARNING, MESSENGER OF DEATH). Despite the lack of extras, I can't complain about this release because neither film has been released in HD before, and the cost is pretty darned low. (Between $8 - $15.) Order yourself a copy of this super cool double feature now from AMAZON, BULLMOOSE, DIABOLIK DVD, or directly from MILL CREEK ENTERTAINMENT!